Mr. Comey said the language suggested by Ms. Lynch was troublesome because it closely mirrored what the Clinton campaign was using. Mr. Comey told lawmakers that Ms. Lynch’s intervention was a key factor in his decision to buck Justice Department tradition and publicly announce in July the details of Mrs. Clinton’s case and why he decided on his own not to bring a legal case against the former first lady. During nearly three hours of testimony, Mr. Comey said the Obama administration advised him on the tone in which he should discuss the investigation of Mrs. Clinton’s mishandling of classified information on her private email server. During a congressional hearing in May — which Deputy Attorney General Rod Rosenstein cited as part of the reason he recommended the dismissal of Mr. Comey — the then-FBI director said he took the unusual step in part because he believed that a June 2016 airport tarmac meeting between Ms. Lynch and Mrs. Clinton’s husband, former President Bill Clinton, had undermined the Justice Department’s credibility to independently investigate the case. “I smell a rat,” I said. Hillary said “What? WHERE?!?! ?” And then she saw the rat and a long, disgusting tongue came out of her mouth and popped the poor vermin into her reptilian mouth. Didn’t matter how dirty it all obviously was. Democrats wallow in filth. These same totally corrupt and totally dishonest liars are now demanding an “investigation” into Donald Trump “colluding” with Russia when there has been absolutely ZERO evidence that any such thing happened. But the Democrat mind says, “Give me a name and I’ll give you a crime.” As long as that name isn’t Hillary Rodham Clinton, anyway. Remember all of the criminals affiliated with Team Hillary that were given IMMUNITY??? Which followed the same procedure Obama used again and again, such as he did with the corrupt Obama IRS official Lois Lerner who had participated in an illegal, criminal effort to weaponized the Internal Revenue Service to attack conservatives and prevent them from exercising their constitutional rights. It doesn’t matter that there is a vastly larger and more organized and more coordinated scandal going on in Obamaland than their EVER was in Nixon’s White House. So the Obama Injustice Department gave a computer specialist named Paul Combetta – “who deleted Hillary Clinton’s emails despite orders from Congress to preserve them – immunity. And they gave immunity to Bryan Pagliano – the man who set up an illegal, secret server in Hillary’s home as she was becoming Secretary of State so she could avoid all transparency laws. But the work of injustice is never done so they kept feverishly granting immunity to more Clinton collaborating crooks like Clinton’s former State Department chief of staff and her personal attorney Cheryl Mills, Clinton aide and lawyer Heather Samuelson and State Department’s information resources management office director John Bentel. Bentel, who was aware that Clinton was using an illegal private email server while she was secretary of state, was given immunity from prosecution for the improper transmission or storage of highly classified materials on unclassified servers. Which is a federal crime. Samuelson was the lawyer who deleted thousands of emails in blatant violation of law ostensibly to purge “personal emails” such as yoga routines and corrupt deals made by the Secretary of State for personal profit. Mills ‘participated personally and substantially as a public officer or employee.’ This is an ‘absolute disqualification’ that ‘carries forward a policy of avoiding both actual impropriety and the appearance of impropriety.’” This refers to her incredibly inappropriate dual roles in “taking part in such a high level task for the Clinton foundation while also working as chief of staff for the secretary of state” in clear violation of the rules established when Clinton became Secretary. The Clinton Foundation – it is now obvious given that donations have plummeted now that Hillary and Bill don’t have crony corrupt access any longer – was never anything other than the most cynical kind of global bribery scam masquerading as a charity. Cheryl Mills literally facilitated that national disgrace by wearing two hats with both hats legally disqualifying her from wearing the other hat. These five people should have been charged with crimes and THEN given an opportunity to plea by giving up their criminal mastermind. But the FBI wasn’t playing fair. It was playing dirty. The FBI is no longer an honest investigation entity. It is a liberal unionized secret police bureaucracy just like the Gestapo was in Nazi Germany, just like the Soviet People’s Commissariat for Internal Affairs (NKVD) was in the Soviet Union, just like the Ministry of State Security is in China. The FBI is no different from other unionized leftist bureaucracies such as the United States Postal Service, which illegally used employees to campaign for Hillary Clinton during work hours. Even FDR understood the treason that was unionizing federal workers and (to put it in Obama terms) fundamentally transforming the government into an entity against the very people whom they are pledged to serve. Even the leftwing fact checker Politifact is forced to acknowledge the clear meaning of what FDR said that the Democratic Party has now totally abandoned as it moved into whole new realms of evil. We are witnessing that now as the FBI and many other federal employees are actively conspiring against the president of the United States voted into office by the people of the United States. We are now witnessing the obvious pathological corruption of the Democratic Party. See former DNC chair Debbie Blabbermouth Schultz IT aide formally criminally indicted on four separate counts. This is the same DNC chair who conspired and collaborated and colluded to get Hillary elected over rival Bernie Sanders. And the former DNC chair’s corrupt and incredibly highly-paid IT scumbag helped her to do that, the evidence shows. This is a party openly steeped in corruption of every possible kind. Schultz kept this guy on the payroll even after it was way-beyond OBVIOUS that something truly stunk to high heaven and paid him and his crew of Pakistani poops an astonishing $4 million compared to what other similar congressional types have for IT payroll. And like a true roach, all Schultz does is slander “the right wing media circus fringe” for her predicament. Schultz says she kept this vermin on because of identity politics, because she wasn’t going to fire the guy no matter what it was obvious he had done because he was just being targeted “because he’s Muslim.” The Dr. Phil question, “And just how are those identity politics working for you?” comes to mind. Everything that the Democrats allege based on no freaking evidence whatsoever against Donald Trump THE DEMOCRATS AND THEIR TOP OFFICIALS HAVE BEEN CAUGHT RED-HANDED DOING. Every single thing. But at this point, to be a liberal means being a pathological dishonest person incapable of virtue, integrity, morality or decency. 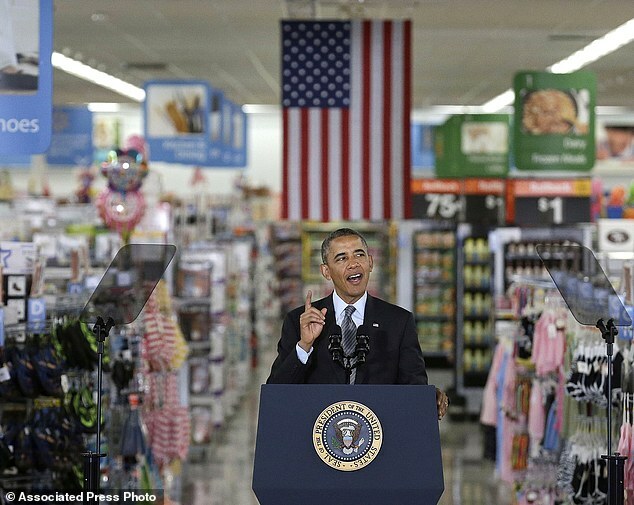 Hey Unions, SHUT UP: Messiah Obama Just Gave WalMart Divine Absolution. So Begone, Ye Racist Paupers! Unions are more than slightly upset that Barack Obama is spurning them to be the whore of the environmentalists. But they probably should have read the fine print before supporting the Whore-in-Chief. Flanked by bargain-priced displays of women’s wear and patio lighting, President Barack Obama came to a Wal-Mart store in Silicon Valley on Friday to praise new steps by businesses and communities to deploy solar energy. The President was showcasing efforts to combat climate change that don’t rely on a disinclined Congress. But in choosing the giant retailer as the backdrop for his announcement, Obama also triggered a backlash from labor unions and pay equity advocates who say low wages paid by Wal-Mart fly in the face of Obama’s vaunted push on pay equity. ‘What numbskull in the White House arranged this?’ former Labor Secretary Robert Reich, who served in the Bill Clinton administration, said on Facebook. Obama said more than 300 companies and state and local governments have pledged to use solar technology, and he unveiled his own executive actions aimed at increasing energy efficiency with a goal of reducing U.S. reliance on carbon fuels. The two tracks underscored Obama’s strategy of sidestepping Congress to advance his own agenda, but they also illustrated the limits of his reach in a bitterly divided government. 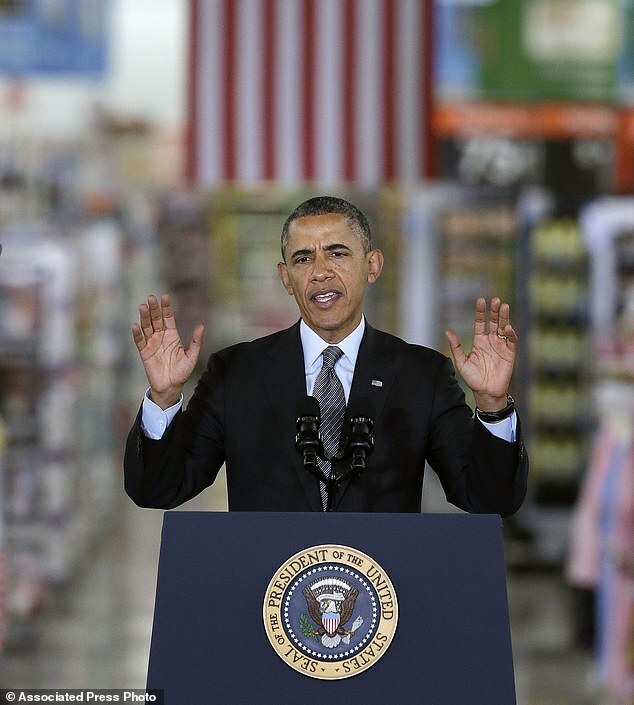 ‘The commitments we’re announcing today prove that there are cost-effective ways to tackle climate change and create jobs at the same time,’ Obama said at a sprawling Wal-Mart store in Mountain View. The solar effort will power the equivalent of 130,000 homes, the White House said, while Obama’s administrative actions could reduce carbon pollution in an amount equal to taking 80 million cars off the road for one year. The White House also announced that long-delayed energy efficiency standards for walk-in coolers and freezers have finally been completed. Ticking off a list of economic and environmental benefits he attributed to solar technology, Obama cast the commitments as part of a broader campaign to reduce American energy dependence, create jobs in renewable energy and lower heat-trapping emissions blamed for global warming. 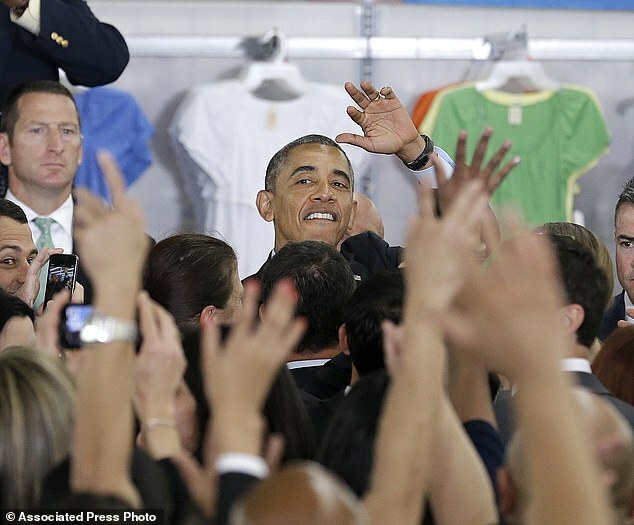 ‘This is what you call a win-win-win,’ Obama told about 250 store employees as he wrapped up a three-day swing through California focused heavily on raising money for Democrats in advance of November’s midterm elections. That’s why he’s seizing opportunities this year to act unilaterally to advance those goals, Obama said. His policies unable to generate momentum in Congress, Obama has increasingly gone outside the federal government to press his agenda. He has won commitments from colleges and universities to expand access to more students; he has created innovation hubs that link businesses and education institutions; and he has drawn attention to companies and state and local governments that have increased pay for workers. Still, that choice of tactics has severely limited what Obama may be able to accomplish, a reality the president acknowledged the night before as he spoke to donors at a fundraiser in La Jolla benefiting House Democrats. ‘Regardless of how hard I push, regardless of how many administrative actions I take, we’re not going to be able to go where we need to go, and can go, and should go unless I’ve got a Congress that’s willing to work with me,’ Obama said. The White House said it chose Wal-Mart because the company has committed to doubling the number of solar energy projects at its stores, Sam’s Clubs and distribution centers. The Wal-Mart location he visited gets about 15 percent of its power from solar panels. Wal-Mart’s president, Bill Simon, said. 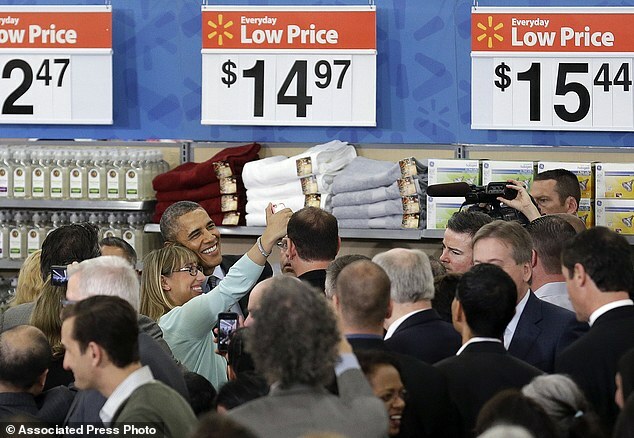 Obama is the first president to visit one of the chain’s warehouse stores. Sorry your messiah betrayed you, unions. Now please shop at WalMart. Otherwise you’re a racist (or the rhetoric of liberalism is pure demagogic slander).